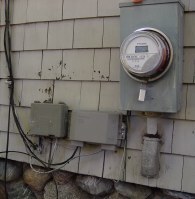 A detailed description of what you see in your neighborhood, on the line near your house, on the side of your house, and inside when you get Verizon's FIOS Internet service. 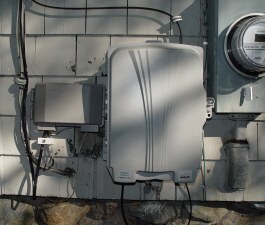 Yesterday I had Verizon's FIOS fiber-optic Internet service installed at my home. 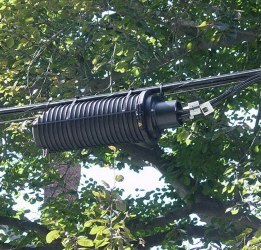 As I pointed out on my blog a few times (see last November 9th, January 28th and February 4th for the reports and pictures), Verizon has been putting up cables all over my city, Newton, Massachusetts. A few weeks ago they started taking orders for installation. I hesitated to order it at first, since my cable modem connection was flakey after a rainstorm (they replaced the cable modem with a new one more tolerant of bad signals or something and other upgrades) and I like having backup (the fiber is replacing a DSL connection) and I wanted to have a week or two of stability before I tried something new in place of the DSL. Also, I have a custom setup in the house and depending upon what they needed, I might end up with cables and stuff where I didn't want it in the house unless I did the right preparations. What exactly would this entail? I first wanted to see what someone else's installation was like to learn the particulars. (I'm posting this on the web for others who are in a similar situation.) My friend Bob Frankston ordered the service, but it turned out that Verizon missed stringing the cables on his block (which they didn't figure out until the installer arrived) so I couldn't learn from his. (This week I saw the trucks out stringing the cable behind his block, so it only took a few weeks to get that fixed -- pretty good.) A couple of weeks ago I saw an installer on my block installing it at a neighbor's house and went over to talk with him. The installer filled me in on the particulars and showed me some things and I decided it was time to order the service. In addition, Verizon sent express letters to Newton residents with DSL (and I think others) to tell us of a special deal ($10 a month off for a year) if we ordered the service before the end of this August, so since I was planning to order it, why not do it now? I ordered the 15Mbps down/2Mbps up service which has a list price of $49.95 a month before the discount. (They also have 5/2 for $39.95 and 30/5 for $199.95.) Terms of service say they "do not permit customers to host any type of server, personal or commercial". You know what they mean (maybe) but they do say it wrong (in an Internet application, each side often plays the part of a "server" as well as "client" -- they are using lay terms in a legal document). They have information on a web site about this service, but some of it is obviously done by marketing people who oversimplify technology. The flash demo tells you it's fast because light travels so quickly. I guess they think electricity travels too slowly over wires to give me the 5 or 15Mbps (but why then do the wires suffice in my home?). And why do they tout the 5Mbps when Comcast is now giving me 6Mbps? The people you talk to on the phones, though, and the installers all tried really hard to be helpful and knowledgeable and will converse with you to try to understand things. They are going all out with trying to have good customer support despite all the growing pains they clearly are having with such a new massive rollout. 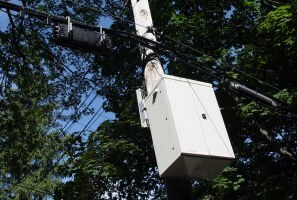 The distribution box is connected to the office on basically one set of fibers and then can distribute that service among the houses. 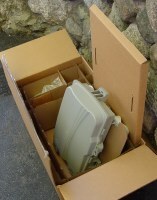 From the distribution box there is a single set of fibers as a "home run" available to each house. If a cable to a distribution box is disrupted, they can connect in a cable from somewhere else and restore service they tell me. Unlike normal phone lines, my house isn't connected directly to the central office with any break requiring a fix to the original wire. Also, when testing the fibers, they can find out exactly where problems (like breaks) are thanks to some cool equipment. 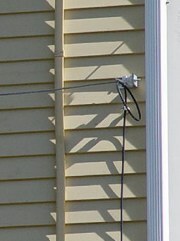 The cables specific to a block have housings every once in a while for connections to the houses. 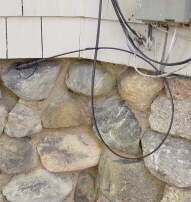 Here is the one that serves my neighbor, along with a close-up of the place where the cables come in. 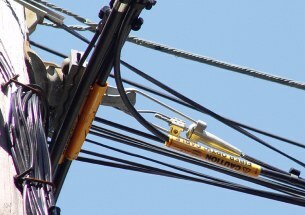 The cable with the orange "Fiber Optic Cable" covering is the one that goes down the block. The thinner cables plugged in are to houses. 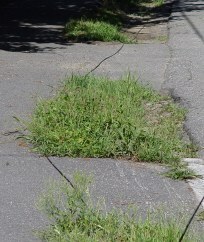 There are two connected here -- I'm clearly not the first person on my block to have fiber. That day, I also pulled some new Ethernet cables from my third-floor office down to the basement where the new service was going to terminate. I was ready. The next day that other crew came to fix the cables to that other house a block or so away that shared the same splicing box with mine. The day after they were back fixing it for my installation. It seems that there is a lot of testing that can occur from the main office to find problems before I do in my house. I like this very much. The cable companies I've had only seem to find problems when I report them and then only when I can have them see that they can't ping my cable modem while they have me on the phone. With intermittent problems like I've had over the years, that has not lead to service I was happy with. I'd like someone to treat this like it was a utility that they'd try to keep up 24/7. Verizon seems to be doing this. The day of installation finally arrived. The installer showed up sometime after 8 AM, as they said. They schedule enough time to spend the whole day if necessary (just setting up your computer could be a time sink and often is if you were previously on dial-up). 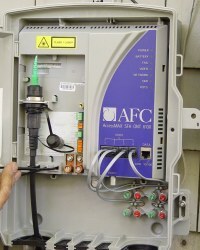 His job is to put an Optical Network Terminal unit (ONT) on the side of, or inside, your house. 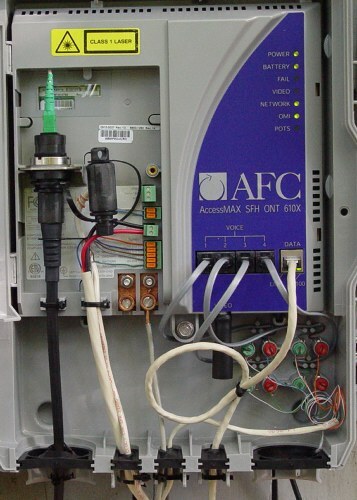 The fiber-optic cable connects to the ONT and the Internet connection comes out of it as a normal 100BaseT cable. We decided to put it where the telephone boxes were already, next to the electric meter. 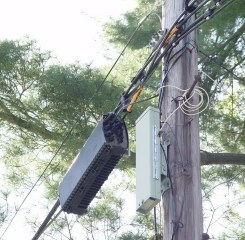 When they put in fiber, they want to replace the copper for your phone lines, too. 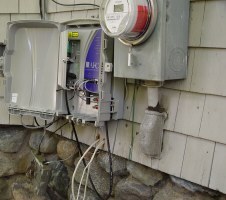 They take all the residential phone lines (unless you have a good objection or it doesn't work) and replace them with connections through the ONT. 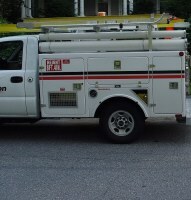 They don't do business lines, yet, so only some of the lines into my house got changed over. The installer decided that the really old phone connection box needed to go and moved the business lines (Software Garden has some) all over to one good box. He didn't actually remove the wires (which they will eventually do) since the ones I have are too intertwined with the business lines they aren't removing. The installer showed me a list of phones devices their system is not compatible with. These are apparently ones which don't work well on the standard ring voltages provided by the ONT. (I think they found this out after complaints from customers that things weren't working.) It includes some Casio answering machines, Radio Shack Caller ID boxes, and a few more units. Here's what the inside of the ONT looks like before most of the wires are connected. The fiber cable comes up on the left with the cap removed (and dangling). Cable slack is stored in a housing behind the ONT (you want to have slack since you'd rather not cut or lengthen fiber cables). 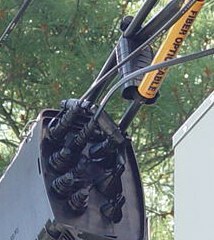 I have a close-up of the power connectors, too. 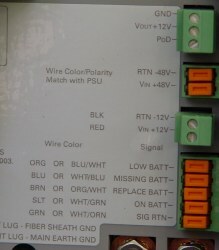 The unit needs lots of connections into the house for power and backup power. In my house, the main phone wiring block is just on the other side of the wall in the basement. 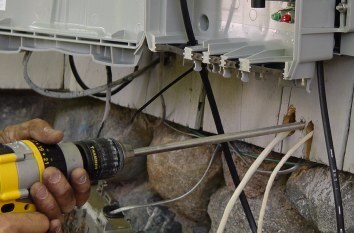 Here you see the installer drilling holes for the different lines: One for power, one for the backup battery, one for the four-pair phone wires (the ONT can do up to 4 lines but we don't need them all), and one for the CAT-5e 100BaseT wire. Eventually they hope to use the ONT's ability to do cable-TV-style cable, too, but that's not available yet. Inside you get two power units. The one on the left holds a normal rechargeable battery and some electronics to let them check it from a distance. The unit on the right is the power adapter and is plugged into a wall outlet (they didn't want it to go into a power strip). (The thick wire between them is an existing power line on the board in the basement.) The second picture shows the other thing they installed: A wall jack for the RJ-45 plug for 100BaseT where I can get the Internet connection they provide. The installer had to do some things with his laptop to have them switch over my phone numbers from the copper wires to the fiber and turn on the Internet connectivity, etc. That takes a while and he went out for a late lunch while it happened. Since I had more than one line (each with its own work order) he ended up making some calls to finish getting them all done. 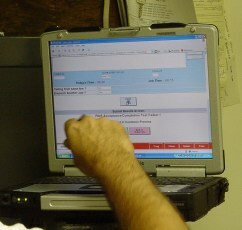 The laptop is a ruggedized Panasonic with a touch screen and wireless (citywide, not WiFi) connection to their VPN. Once everything checked out, he hooked up the normal D-Link router they include in the deal. I had him use his laptop to set things up because I didn't want to install their software (as I recall, Verizon likes giving you who-knows-what to "help" them give you support, put in the free MSN Premium that's included, etc.). I just wanted to get the service going and over the next few days I'll figure out how I want to connect it into the computers and networks in the house. Once that was all done, the installer cleaned up all the dropped wire insulation, empty boxes, etc., and we said goodbye sometime around 4 PM. I then connected my line to the router and plugged it into my laptop upstairs. Things work well. I downloaded a log file from the bricklin.com server and got a download at over 13Mb/second. I uploaded a 25MB podcast as a test and got 1.95Mb/second. Pretty good. I logged into the router (the name and password got set to my Verizon ones) and saw that it was configured as a normal PPPoE just like my DSL connection was. 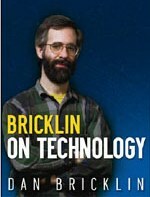 Dan Bricklin is best known as the co-creator of VisiCalc, the first PC spreadsheet. He is author of the upcoming book Bricklin on Technology being published by Wiley in May 2009. I write this a few weeks later: Verizon trucks are out on my block again today, this time installing FIOS for another neighbor (of 8 houses in our section of the block on both sides of the street, at least 4 now will have FIOS, and at least one has decided to stay with their Comcast cable modem...for now). This morning, Walt Mossberg wrote in his Wall Street Journal column: "I consider Fios a good service and a good bargain. If you are a heavy Internet user, and you can get it, I recommend you do so." I've been using the system since it was installed. Here is some more information: It's been working well. Tests I've run show that I do indeed get up to 15Mbps. Various "Web100 based Network Diagnostic Testers" say 1.6-1.85Mbps up and 12-15.4Mbps down. One server I download from (the log files) seem to always max out at 13Mbps, but that must be on its end. Other downloads do go the full speed. My uploads of podcasts (40 minute ones for my Software Licensing Podcast and the DiamondCluster Open Cell Phone Podcast), etc., routinely get 2Mbps. One effect of this is that downloads that used to swamp my connection so that I couldn't do much surfing at the same time now have enough headroom to let other Internet uses continue at the same time (maybe because of effects of adding more bandwidth like those I described in "Why We Don't Need QOS: Trains, Cars, and Internet Quality of Service"?). Note: This higher speed capacity doesn't speed up slow response from web sites. If they took 5 seconds to respond, it still takes 5 seconds. It's mainly an effect noticeable on large downloads and uploads. 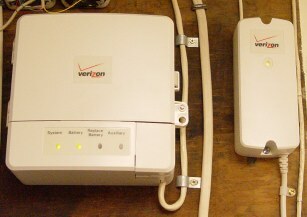 Something about my setup that you might want to know: I left the D-Link router in place, just as Verizon installed it. I don't, though, connect my computers directly to it, but instead use an additional router. I took my Linksys WRT54G Wireless-G Broadband Router and unplugged the connection to the cable modem. (For now, the cable modem is switched to be connected to another router and provides open WiFi to guests in my home and serves as a backup.) I connected one of the LAN jacks on the D-Link not to a personal computer but rather to a cable that goes to the WAN jack of the Linksys (using the cable from the basement to the 3rd floor). I didn't need to make any changes to the Linksys settings: I have it request a DHCP address from the D-Link just as it did to Comcast through the cable modem. The D-Link uses IP addresses inside my house that start with 192.168.0.? and the Linksys uses 192.168.1.?, so I can easily get to the D-Link settings page from browsers running on PCs connected to the Linksys without any confusion or special settings. Since I already had a wireless router this saved me from needing to pay the extra money for one from Verizon or needing to locate the Verizon-provided router out of the basement in a more WiFi-friendly place. I also am not as concerned as some seem to be about Verizon having access to a router protecting my local network (if they recommend upgrades and you need to download new firmware with unknown capabilities) -- I have another router blocking things after it. I've seen with Verizon DSL that they like to "help" you with special software on your PC, etc., that may (or may not) be helpful to non-techies but I'd rather have more control myself over my configuration. I can always run a PC directly connected to the D-Link for diagnostic purposes if they need it. 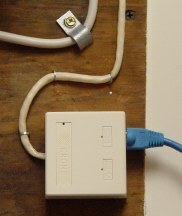 The D-Link connects by PPPoE and needs to be set up differently (it is similar to DSL setups, as I wrote before). Apparently, the back-to-back routers don't seem to slow things down much, since I'm getting the full speed they specify from Verizon.